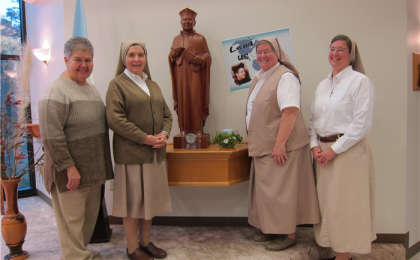 Blog | Teresian Sisters | Joyfully making Jesus known & loved! The Province of St. Francis de Sales met in Covington, LA during Thanksgiving week to celebrate the last half of our Chapter. Facilitated by Sr. Dot Trosclair, OP, it was an exceptionally peaceful and meaningful gathering. Our main theme was the XVII Chapter Document, just printed in English, Assuming the Ethics of Care for Our Common Home, based on Pope Francis’s encyclical. Sr. Giselle Gomez, who just finished 9 years serving on the General Council, gave excellent presentations on “Theory U” , a new way of looking at organizations and how they can better interact with reality to help bring about desired changes; she also spoke to us about the reorganization process that is envisioned as we search for our own pathway in the Americas. Reflection, creative prayer times together, group discussions, looking concretely at the kinds of care called for by the Gospel, by our General Chapter, and by the world we live in today, were all directed towards formulating a vision to lead us through the next 3 to 6 years. In the midst of our meetings, it was very natural to celebrate Thanksgiving with great gusto, as we were indeed grateful for all that God has done through us and for us. 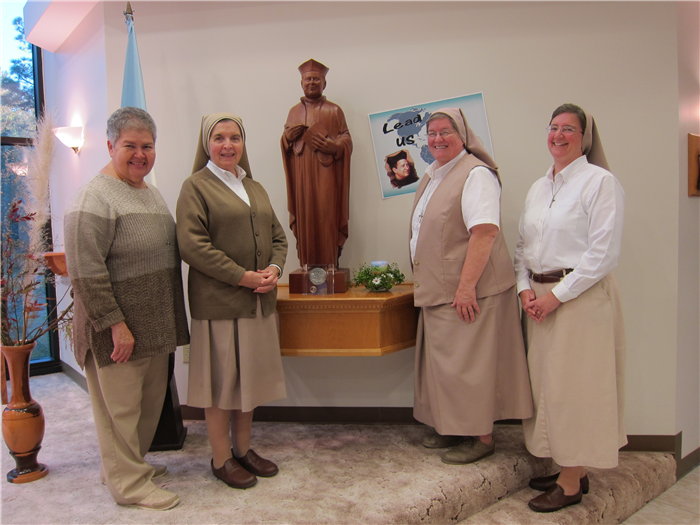 Finally a new Provincial Team was announced: Sr. Marina Aranzabal as Provincial, Sr. Bertha Montiel as Vice Provincial, with Srs. Gina Geraci and Clarice Suchy as councilors. We give thanks for their availability, and we ask all to join us in praying for them as they assume leadership of our province. We returned home feeling inspired and enlightened, challenged and determined to live our All for Jesus! 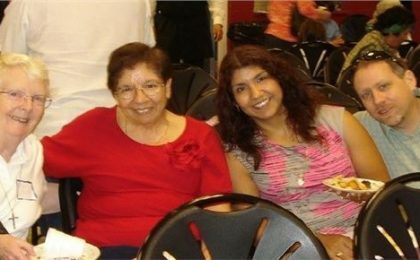 Our very good friend and Teresian Associate Sonia Torres was called home to Jesus on October 3, 2017. 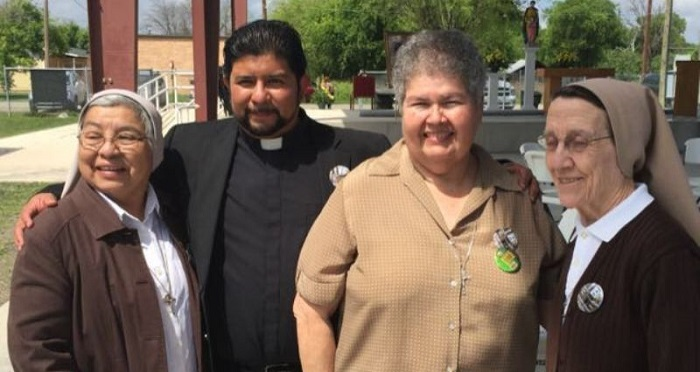 After retiring from many years working as a registered nurse, she came to help with the elderly and infirm Sisters on Fair Avenue in San Antonio. 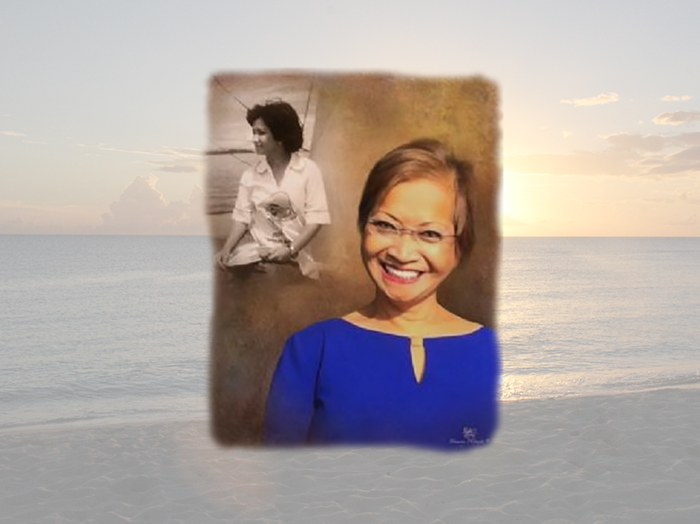 Shortly thereafter, Sr. Angeles Sendin became the coordinator of that house, and found in Sonia “a lifesaver, an angel of mercy”. Truly the sisters were in the best of hands with Sonia, who took them to every doctor’s visit, giving a thorough and detailed professional report on each visit. 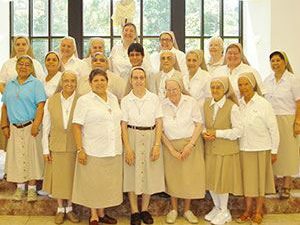 The Sisters knew they could count on her; she was always patient and caring with each one throughout her 20 years of service there. Sonia was also unassuming, quietly using her experience and knowledge for the sake of others. 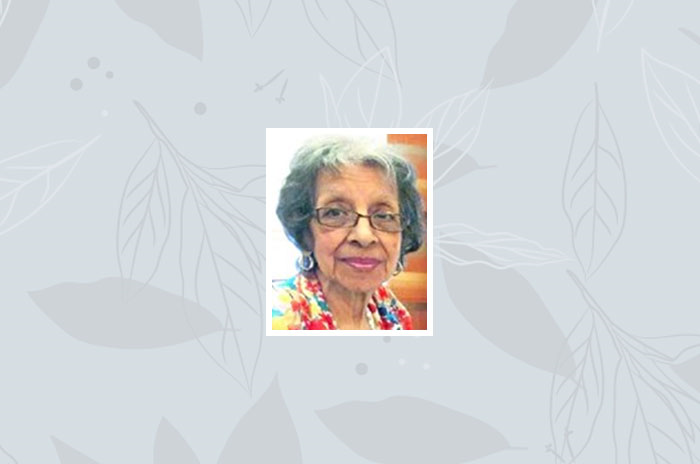 Most of us were unaware that she held a degree in nursing or that she had tirelessly confronted social injustices throughout her professional life. We only knew that Sonia was a woman of deep faith, generous to all, committed to a life of service and providing for the needs of others. In later years, she faithfully visited our sisters at St. Francis Nursing Home, and never empty-handed; she always brought a special treat wherever she went. 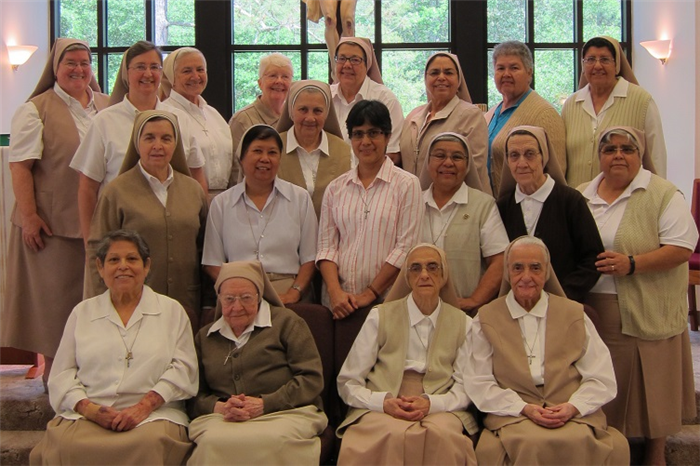 Sonia’s family and the Teresian Sisters will miss her greatly. For so many of us, Sonia was a model for holiness, inspiring us to be holy, and to love and trust in our Lord , commending our prayers to our Blessed Mother. 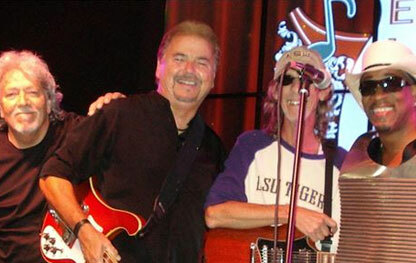 May you rest in eternal peace and joy, dear friend. 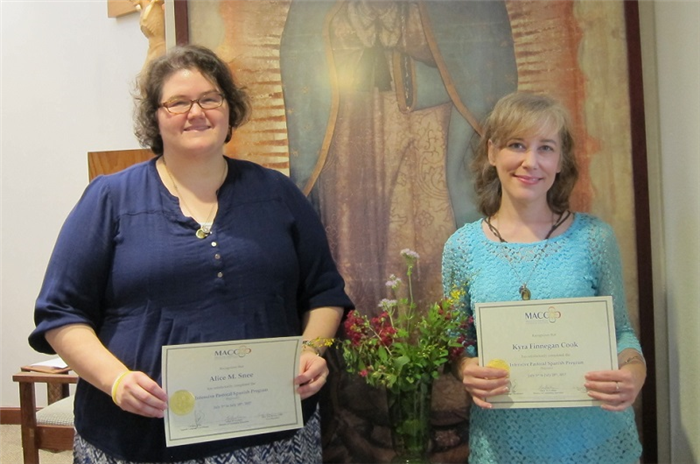 Pre-Novices Kyra Cook and Alice Snee spent a month in San Antonio, studying Spanish at the Mexican American Catholic College. They stayed with us at St. Teresa’s Community and commuted to MACC, where they learned essentials of beginning Spanish in a pastoral context, including Mass and Scripture. The Teresians have long had a wonderful relationship with MACC, and are glad that our new Pre-Novices continued that tradition. It was wonderful for us to have them sharing our community life, and we appreciated their hard work to begin to acquire a new language, never an easy task. Sharing prayers, meals, celebrations and a few outings to the Missions and the Riverwalk was a wonderful experience for all of us. We also enjoyed MACC Night, for Misa, Mesa y Musica, receiving a warm welcome from students and staff. Sr. Marina shared photos and describes the simple entrance ceremony as Kyra Cook entered the Society last weekend, during Vespers for the Eve of Pentecost. “We had a very intimate gathering composed of the sisters of Covington and New Orleans, as well as our two visiting sisters from Spain and Ivory Coast (Ana and Lydie), Sr. Theresa from Magnificat House, and Kyra’s father. The service was beautiful, inviting the Holy Spirit to come into our hearts and lives. As part of the entrance ceremony, Kyra received the Bible, given to her by Sr. Gloria Murillo, the Autobiography of St. Teresa, given to her by Sr. Angeles Sendin, and “The Spiritual Experience of St. Henry de Osso,” given to her by Sr. Marina Aranzabal. Kyra and her father were both very happy, as were all of us. After Vespers we had a very nice reception in the Cafeteria, prepared by her (now) fellow Pre-Novice Alice Snee. 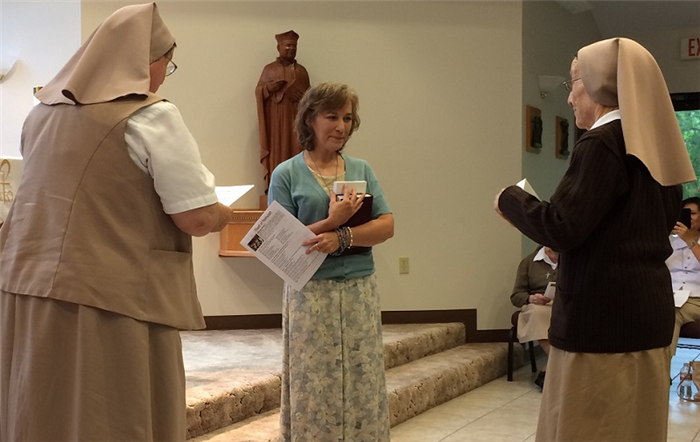 St. Francis de Sales Province held the first part of its Provincial Chapter April 20 – 23 in Covington, LA. Sr. Dot Trosclair, OP did a magnificent job as facilitator and Ms. Louann Hood quietly and lovingly took wonderful notes for all the meetings. Various sisters prepared prayer services from our first meeting until the end, and all helped to inspire us to leave all to the Spirit. Our meetings dealt principally with looking at ways to reorganize our provinces in the Americas, to respond more fully to the needs of immigrants, to better use the internet as a tool for Teresian teaching, and to protect our Mother Earth. A spirit of peace prevailed through all our conversation and decision-making. In between the meetings we had time to share with each other, renewing bonds with those we had not seen for some time. Meals provided more sharing of friendship and (scrumptious!) calories, thanks to Mrs. Paula Guzman, our amazing cook, and kind Associates who sent added goodies for us to enjoy. On Sunday, May 25, St. Joseph Church in La Pryor, Texas celebrated its 100th anniversary. The only Mass celebrated in La Pryor or Batesville that day was the Confirmation Mass presided by Bishop James Tamayo together with Rev. Gustavo Ortega, parish administrator. Both the Mass and reception were held at the park, to accommodate the 300 people attending. 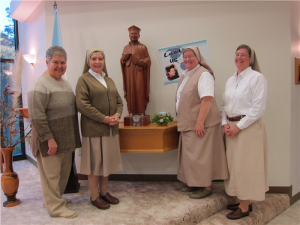 Teresian Sisters Bertha Montiel and Dolores Aviles were very much present, along with Sr. Angeles Sendin, who came from Louisiana for the celebration to represent Provincial Sr. Gina Geraci. The seven confirmandi were very happy with their meeting with the Bishop before Mass, as he got to know them in a personal way; he also invited them to ask him anything they might want to know. The choir from Eagle Pass sang beautifully for the Mass, and the meal was prepared the parish organizations; leftovers were then brought to the elderly and infirm.Sr. Berta commented that it was truly a wonderful experience of community as everyone contributed by bringing something to share, by working, serving, cleaning up. A big THANK YOU to all who made it so special!!! “SEEK is a conference for college students from across the United States, sponsored by the Fellowship of Catholic University Students (FOCUS). 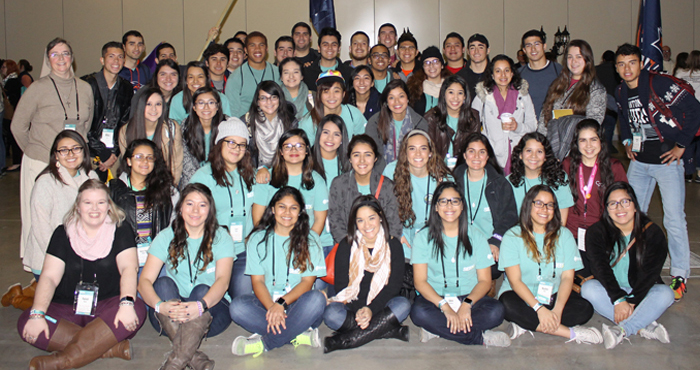 This year brought over 12, 500 college students to participate in the 5-day conference in San Antonio with the theme “What Moves You”. Each day included opportunities for mass and adoration, special morning sessions for men and women, and impact sessions on our faith and the call to be modern day disciples of Christ. In the evenings students also heard inspirational keynote speakers on topics related to evangelization and living out our faith in the world. All were encouraged to recognize the call to greatness that each has uniquely received and to not be afraid to live out their faith on their college campuses. For many of the students one of the highlights was Thursday evening’s time of adoration and reconciliation. Being with so many young people in prayer before the Blessed Sacrament was a truly moving experience. Our very dear friend Mrs. Rose Garza passed away at home in Uvalde, Texas, on January 9, 2017 after an extended battle with cancer. Always laughing, filled with joy and love, Rose brightened the lives of all those she came in contact with. And they were many! With a Ph.D in nursing, she worked hard for improvement in rural health and was involved in many outreach ministries, including the Henry de Osso Family Project, ministry at Sacred Heart Church, and so much more. You can read more about the wonderful gift of Rose’s life here. We shall miss you Rose, but we are sure you are keeping Heaven smiling now. Pray for us! Thank you, Rose, you are special to all of us, and we will never forget all you have done for us. Our prayers are with your family, and we know that you continue watching over us.